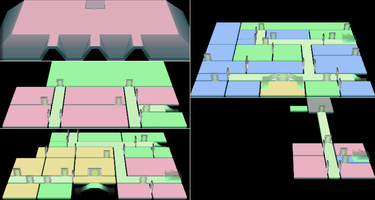 The Graveyard (Japanese: 墓地 Graveyard) is the final room in Area Two of the mansion in Luigi's Mansion. Luigi also fights the area boss from this location, Bogmire. The Graveyard is located north of the Boneyard; it is an enclosed rectangular area with eight tombstones that occupy most of the room. At the top-center of the location is a small slope with a few steps leading to the main headstone, which Bogmire rests under. Two torches appear on each side of the tombstone, and a Fire Elemental Ghost can spawn from either one. A single Red Jewel is the only treasure in the Graveyard. Luigi can obtain it from the downspout at the bottom-right corner. Some tombstones may release a Heart if Luigi taps them, but the top-left one always releases a large Heart that restores up to 50HP. After Luigi vacuums up Spooky in the Boneyard, he must scan Spooky's kennel for it to make a small gust of wind dragging him into the Graveyard (similar to entering the Hidden Room from a mouse hole in the Butler's Room). 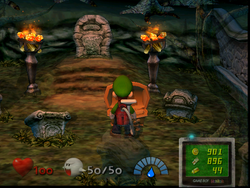 After entering the Graveyard, Luigi must tap a gravestone directly below the main one to summon three Mr. Bones (or five in the PAL Hidden Mansion). After capturing each of them, a blue aura glows around the main headstone. Luigi must walk to it, causing Bogmire to rise from it. Luigi is transported into an arena to fight the boss. When Luigi vacuums up Bogmire, he returns back to the Graveyard, where a large chest spawns next to him. Luigi must open it to collect the Courtyard Key, allowing him to start Area Three. This page was last edited on October 31, 2018, at 16:18.